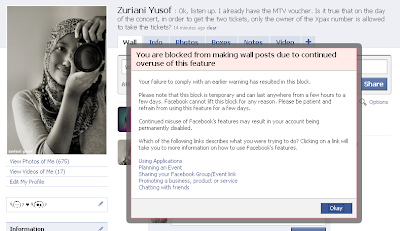 Damn, I’m officially blocked from using Facebook. How crazy is that? 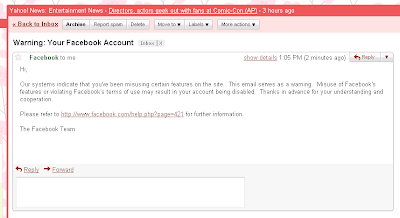 First I received an email from Facebook, which I completely ignored it. And suddenly, I can’t make any wall post anymore. Seriously Facebook, you really hate me that much eh? They claimed that I’ve been posting too much url on the wall, and they considered it as spamming. Oh what the hell? It’s my frigging wall, and I can post whatever I want! Is it a crime if I answered my entire friend’s question by giving them the url’s? It’s easier that way. Frankly Facebook, your attitude it appalling. I’m really pissed off with them at the moment. High handed, autocratic, rude, and flat out wrong. Can someone remind me why we all use this thing? It’s not like I can’t live without it. But it’s a frigging Facebook. That’s the only entertainment I can get from the web. I stay connected with friends via Facebook, I have access with the latest juicy gossip from Facebook, I watch the stupidest video of my friends on Facebook, even I can save up a lot of my prepaid by chatting with friends via Facebook. It’s like my social mojo. Ok fine, I think I can live without Facebook for a week or two. But Facebook, things between us is not going to be the same again. You pissed me off so badly. abes cmne anda put the status kat facebook yan? buatla account baru?tak leh ke? 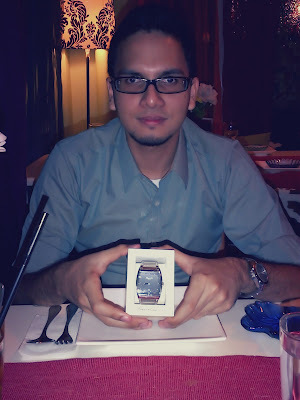 die ade cakap ke sampai bile die block? hahaha. pelik betul ni? kenape ek? kenapa kenapa? does Mark Zuckerberg read this?? Who the heck is Mark Zuckerberg?? Kalau dia owner Facebook, just tell him that i hate him. Thank you. anyway, shud be able to log in again after 1-2weeks. aku x pernah nampak facebook bahagia macam ni sejak kau kena block. aman je. tenang. happy. fun. exciting.